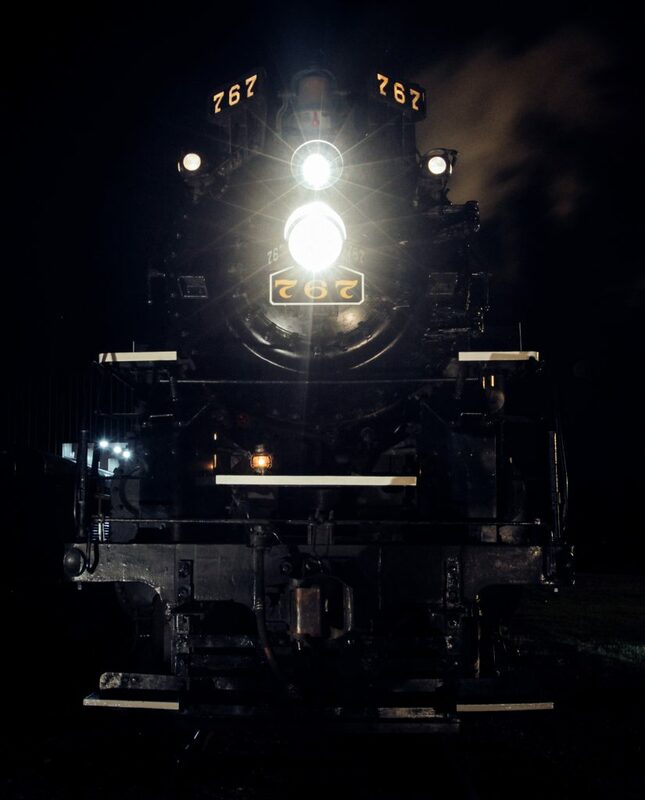 Though the 765 is the only surviving Nickel Plate steam locomotive operating today, she was once accompanied by 79 sister engines charged with moving fast freight and passenger trains between Chicago, Fort Wayne and Buffalo, New York. On July 15th, 1951 fate would intervene on the 767’s behalf for the first of three times. That evening, the locomotive was pulling Nickel Plate Train no. 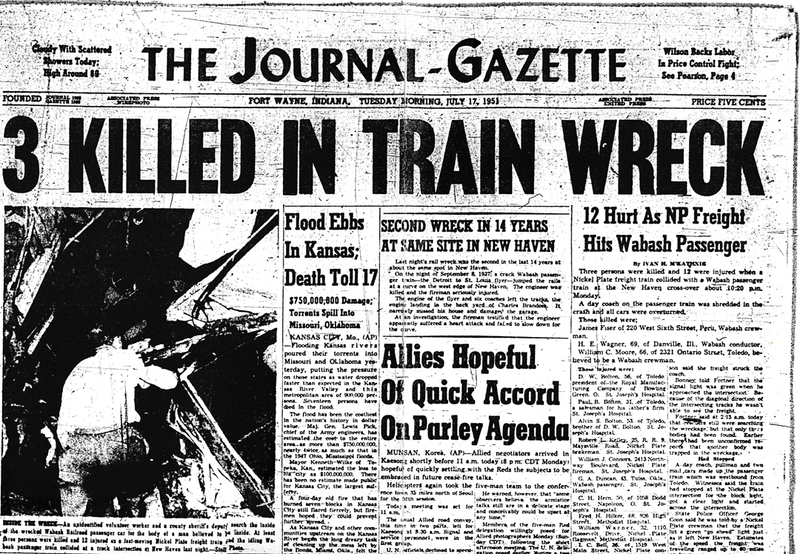 51 – a freight train nicknamed the Flying Saucer due to its timetable speed – and was headed westbound into Fort Wayne. 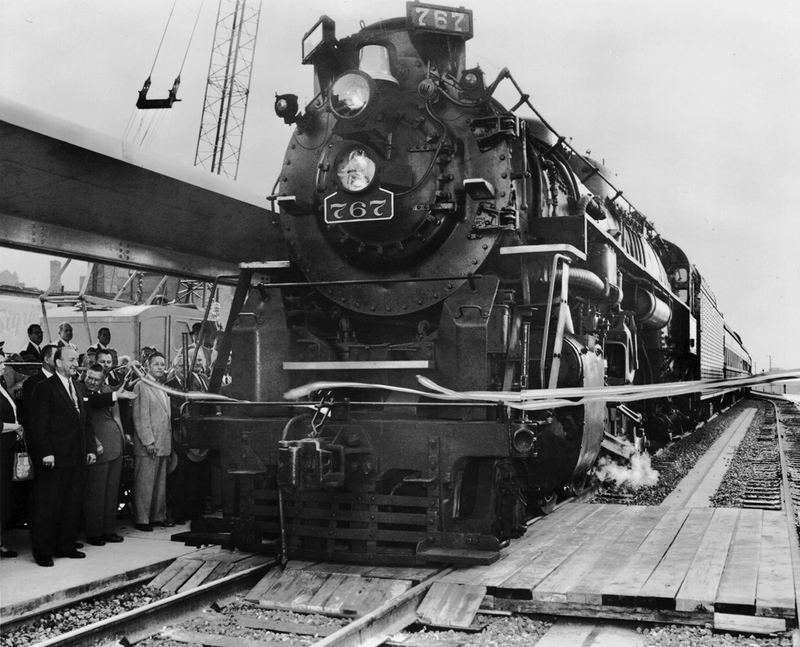 At the railroad’s new terminal in New Haven, the Nickel Plate crossed the Wabash Railroad’s competing line to St. Louis. At 10:22pm, Wabash passenger train no. 13 entered the crossing at a crawl, having mistaken the Nickel Plate’s green signal for their own! As the 767’s headlight revealed the passenger train ahead, its engineer put the 60MPH train into emergency, immediately setting the brakes. Within seconds, the 767 tore into the passenger train, shredding the Wabash buffet car in half and derailing both trains. Three passengers perished in the wreck, one later on. Two were Wabash Railroad employees. Unfortunately, four passengers aboard the passenger train were killed and thirteen others were hurt. The 767’s front-end and left side where it came to rest were demolished. 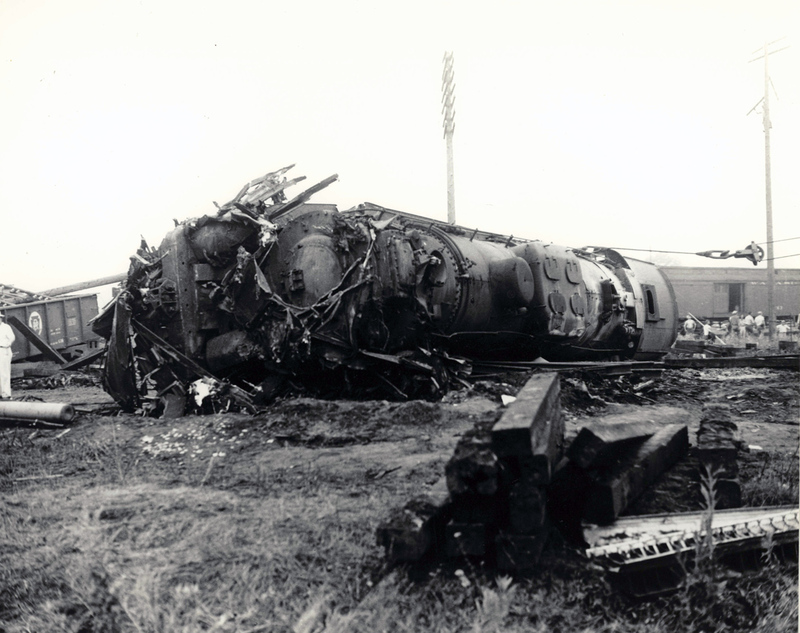 The locomotive required extensive repair – and its crew managed to escape, though not without serious injuries. 767 has been pulled away from the interior of the Wabash passenger train, its front end completely destroyed. Herb Harnish, Photo Art Schull Collection. The 767 was returned to service after rebuilding and in 1955, found itself in the newspapers once again. 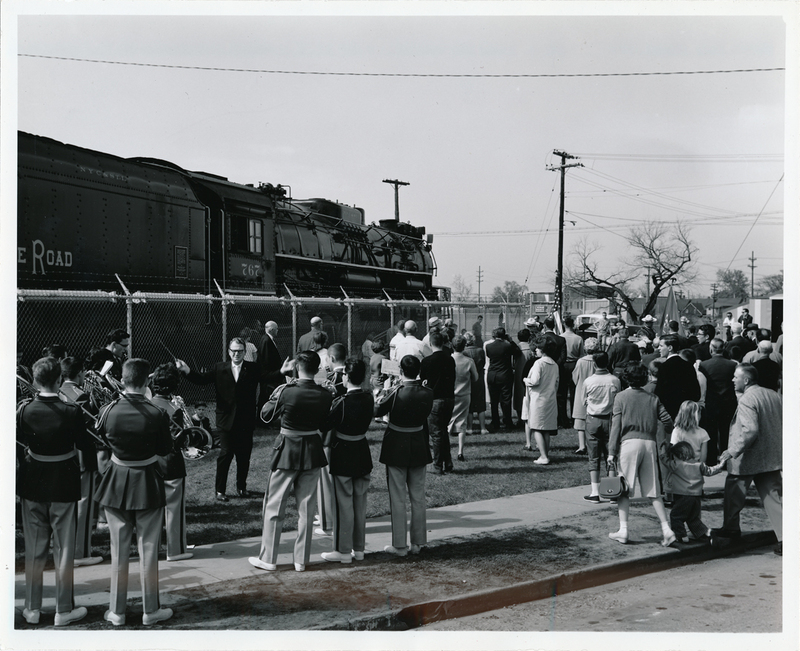 On October 4th of that year, the locomotive was used in a ribbon cutting ceremony to celebrate the opening of a decades long effort to elevate the Nickel Plate Road through downtown Fort Wayne. The project, which removed a dozen grade crossings and unsnarled street traffic, lead to an explosion of development north of the St. Marys River. Despite the 767’s historic presence at the celebration, it was rumored to have developed an unusual “gait” after the 1951 wreck. 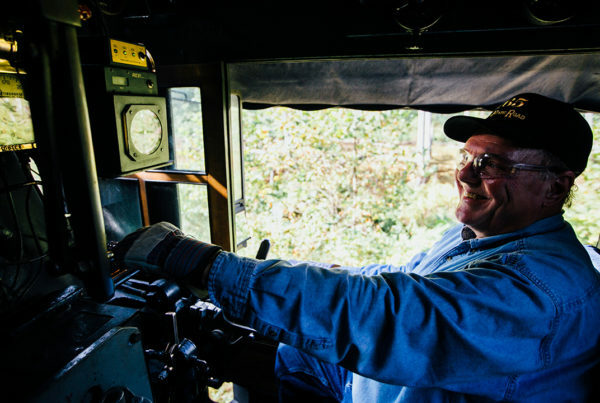 In July, 1958, the 767 and the railroad’s other steam locomotives were stored serviceable – waiting for another call to service that would never come. As the City of Fort Wayne continued to expand, fate and the 767 would intertwine a final time. 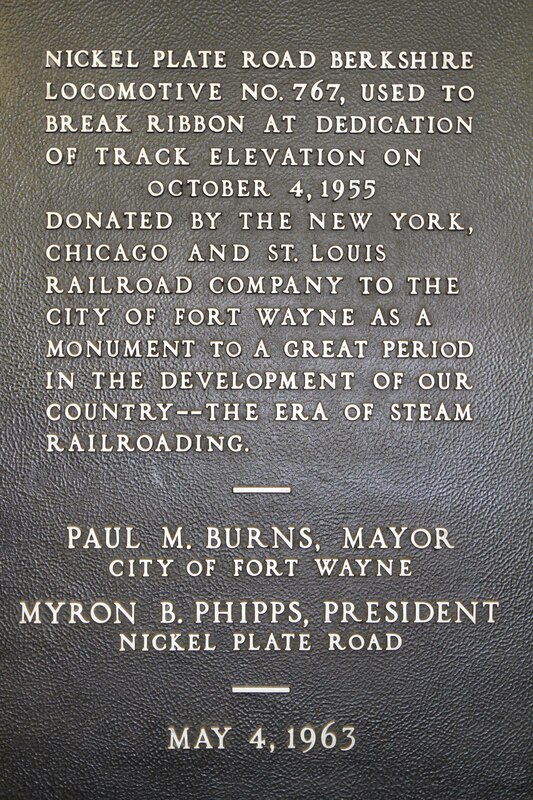 Recognizing the impact that the elevation project had, the City requested that the Nickel Plate donate the engine used in the opening ceremony for display. 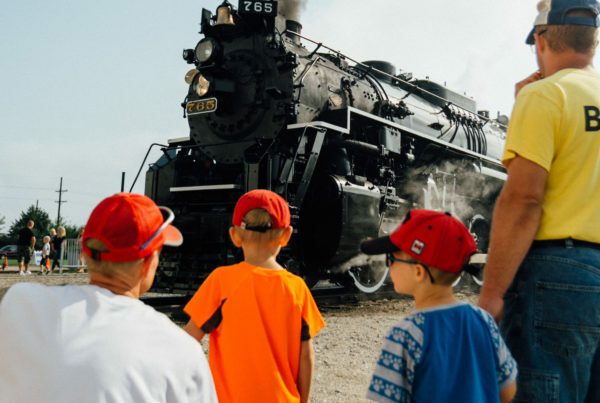 As railroads across the country retired their steam locomotives, it became somewhat of a ritual to place retired engines in city parks or museums. The Nickel Plate, however, had a problem: the 767 had been stored outside, vandalized and was generally not in good condition. The employees formulated a plan. Only one steam locomotive in Fort Wayne had managed to elude outdoor storage for most of its retirement: no. 765. An engine favored by crews between Fort Wayne and Chicago, it had been kept in good condition and was mechanically complete. The order came to discretely renumber the 765 as the 767. The effort was meticulous enough that the real 767 was also renumbered in order complete the swap. As far as the Nickel Plate was concerned, they were giving the city their 767. Disguised as the 767, the 765 has been renumbered and a ceremony celebrating its installation in the park is being held on May 4th, 1963. That’s the North Side High school band playing at left. As the 765-as-767 was installed in Lawton Park on May 4th, 1963 the original 767 was hauled to Chicago for scrapping, meeting its end sometime in 1964. 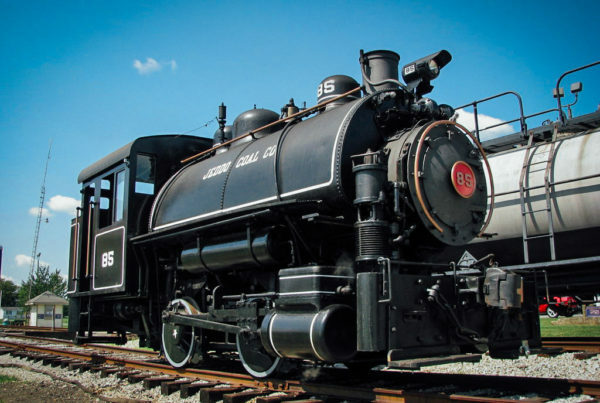 Only ten years later, the locomotive would be removed from the park for restoration and operation – and its original number was returned since it had never operated as the 767. The 765 renumbered as 767 – once again! They don’t make steam locomotives – or plaques – like this anymore. For a brief time, the 767 has returned to honor the engine’s special history and the unique legacy of a city with enough foresight to have saved it for generations to come. The 765 will remain renumbered as 767 until the end of 2016. Other cosmetic changes, such as the Mars Light, will remain.